I received some jolly interesting replies ranging from observations about their grilles to their general banality. There was also a good guess about engine displacements. Alas, despite their ingenuity and their not being 100% wrong, none of the replies were precisely, exactly and perfectly what I was looking for. So, in order to lower people’s tension levels I will reveal the answer to the puzzle now. Let’s review the cars in the image insofar as I am able – the ones at the back are slightly harder to see in the image. In the front sat the Honda Jazz from 2009. Next to it shivered the 2008 Mazda 2. By that car’s side we see a Seat Leon from 2006. If we look right of that: a Mitsubishi Colt from 2005. Mazda have another representative in the form of a Three (2004). Parked further away still is Citroen’s 2003 charmer the C3. And Peugeot’s very own 307 from 2002 lingers at an even greater distance from the front. By the end of the row we have reached the 2001 Skoda Fabia, a car of timeless correctness, if you ask me. Missing from the sequence – and this perhaps might have confused people or thrown them off the scent like a rodeo rider being hurled from an angry mare: the 2007 Opel Corsa. I presume the pattern is now clear: all of the cars were winners of the Danish Car of The Year award. The second photo shows a few more of them, parked outside a building in an industrial estate in Viborg, Denmark. The building and grounds are temporary home to an exhibition showing almost all the winners of the Danish COTY from its inception in 1969 to date. There wasn’t a single Daf or Mercedes in among them, now that I come to think about it. No Rover either. No Lancia. The second photo shows another selection: the VAG Up trio (2013) and the 2015 Citroen Cactus. The 2014 Octavia is not in sight. Though a pleasure to see some of the older winners, the general exhibition left a lot to be desired. One of the deficiencies was the slightly irregular layout of the cars where the odd winner was misplaced. And second, the incredible banality of the exterior display where the more recent winners look like nothing so much as any third-tier used car dealer in Jutland. I notice that of the winners since 1969, only one brand is extinct though many have changed owners. That dead brand is Simca whose 1307/1308 won in 1976. That by an amusing irony brings me to the recent spontaneous competition to find the car with the most nameplates. The Simca 1307 had many names : 1309, Chrysler Alpine, Chrysler 150, Simca-Talbot 1510, Dodge Alpine and Simca-Talbot Solara. Isn’t the 1307 etc name remarkably odd? Four digit names are rare and usually involve lots of zeros e.g 9000 and 6000 or at least end in a zero 2000 and 3500. 1307? It’s a number for a combination lock. I will return to the exhibition in greater detail very soon. The 1307 was in the popular 7CV class. There were an 8cv 1308 and a plush and powerful 9CV 1309 as well. The same system was used on the small 1000, that became 1005 and 1006. It is perfectly logical for a 1970’s French person, but in perfect French mannen it doesn’t make any sense to the rest of the world. Great site by the way, very insightful. I visit it almost daily. Thanks! Hi Maurice: Thank you very much indeed for that. So, the naming system was 130 plus a number related to the tax rating. How odd but it makes sense so long as it´s in a national market. It´d be different if Simca had survived as a success – then you can call your car whatever you want. I am glad you enjoy the site! Um, yes. That was the answer. I will go and read the sermon on amounts now. Oh, and I agree about the Mk1 Fabia; a timeless and perfect design. Sorry you didn’t win. Shame the riddle wasn’t about Zimbabwe: I know all the coty winners from Zimbabwe but not the Danish ones. Pretty sure it was Britain’s COTY around 1983. Yes, not UK, but 1980 European Car Of The Year, whatever that might mean. I notice the Mk1 Focus didn´t get a look in, which is frankly wierd given its huge impact and good critical reception. The Renault 21 is a puzzle – not a bad car but not outstanding. Rover Metro? Rover Metro? For flip´s sake. Golfs III and V are in, but not Golf IV. That’s a satirical list, isn’t it? Was the Golf 3 the one with the reliability problems? And wasn´t Golf 5 another version of the same proposition. I don´t recall it having any especial characteristics. I love the Golf VI because the design has real substance and solidity, which puts me in mind of the Mercedes-Benz W124. 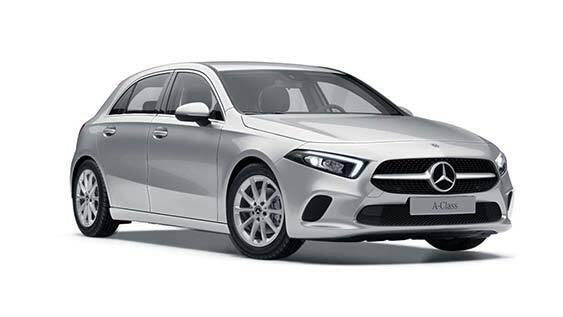 It is the A-Class Bruno Sacco would have designed. Puzzle for today: Golf VI was notable for abandoning one Golf design trope. 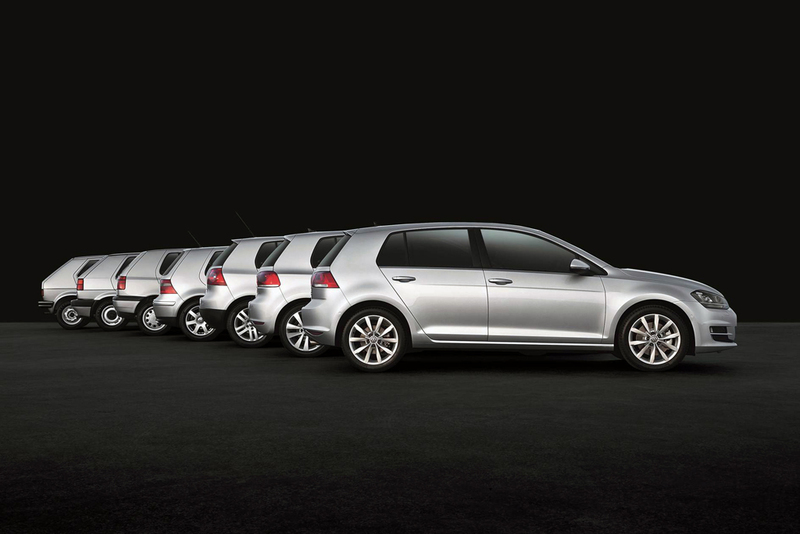 Golf VII reverted to tradition and re-adopted that feature. What is it? Setting up your own rival Games franchise aren’t we ? This is quite a good one actually. I thought about it but didn’t find anything. I love the Golf II, if only for the memories, my brother had a 3dr red ‘Memphis’ for a few years. But in retrospect I don’t think it’s my favourite one. It looks a bit top heavy, as if the bodywork overwhelms the wheels. An easy one for you (I think! ): looking at the Golf VII, which other car had a similarly trapezoidal-ish shaped fuel cap cover located on its C-pillar ? Btw, during the games I want to be known as ‘Strada G-wagon’ from now on. It’s my stage name. It is such a good name. Thanks Mitsubishi ! And it looks like they’ve airbrushed the Golf VII’s fuel cap cover out on that picture, it normally sits on the right-hand side. Is it a trope that showed up on EVERY generations except the VI ? Is it something to do with the roofs of the cabriolet versions ? They were all fabric convertible tops except for the Eos, which could arguably be considered a Golf cabriolet replacement at the time ? For the avoidance of confusion, it’s “Yes” to NRJ’s question at 09.42 and “No” to his question at 16.46. Hi Murat. Don’t worry, it won’t: I will reveal the answer at 22.00hrs GMT if nobody gets it beforehand. The VI is the only one with front wings higher than the bonnet ? I doubt this is it, it hardly sounds exciting to be honest. I would think it may be around the DLO/C-pillar or generally in the upper body area since you said it didn’t affect the cabriolets who share most of their bottom parts with the hatches, stylewise at least. I suspect it’s below the C-pillar. On all Golfs the leading edge of the rear light cluster is in a straight line with the hatch shutline above, but on the Golf VI it bites into the rear wing. Never noticed that before. …is the correct answer! Well done, Simon. Ok ! I did have a look at the taillight area but because the Golf 1 had “old times” bumpers I thought it wouldn’t be around there. Congratulations to Simon ‘Smilie faces’ Stahel. Simon’s prize of a beige anorak and matching slacks is in the post. The gradualism of the Golf´s design approach is fine by me. Sometimes I don´t much care for the precise way they they go about it. The grille and lamps of the Mk3 always looked wrong to me and the “baroqe” double creases on the new one strike me as breaking VW´s long-standing (and worthy rules). There´s room for a variety of approaches to the middle market, just. VW go for slow change from model to model while Ford (mostly), Renault and Opel have gone for step-changes. The new Focus is most like the Golf in that Ford have decided on something more like a gradualist change than a step-change. Opel have done okay with their Kadett/Astra series though you´d have to be a philosopher and a fan to see the underlying consistency. Renault throw paint at the wall every time a new Megane is needed. Some of it hits the target. Is it me or is the car far too ornate/heavy/bulbous? The same goes for the much-adored Laguna replacement whose name eludes me (but I remember the bit about the ostrich feathers). Beige!!! Thank you Daniel! It will perfectly match my beige base-spec Golf II 3-door. It has been real fun here with all the puzzles recently – be they ‘official’ ones or not. 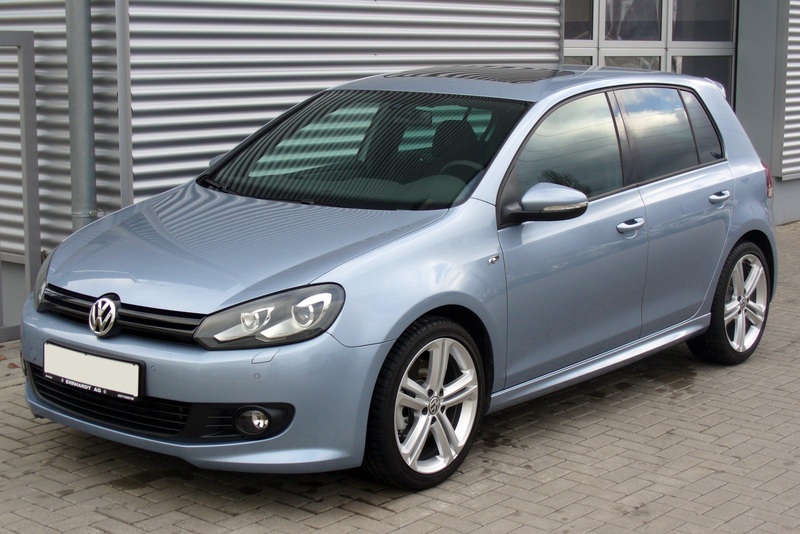 You’ll be relieved to know that it’s mainly the Golf II 5 doors that I find dumpy, the 3dr ain’t so bad. Good morning, Richard. I’m perplexed by your comment regarding the new Focus. It is certainly more Golf-like than before, but I would have said that it has broken decisively with the gradualist approach of its three predecessors, particularly in the treatment of the DLO, to the extent that, without badging and the distinctive grille, nobody would have recognised it as a Ford. The Golf VII contrives to look less substantial than its predecessor, thanks to the (overly?) sharp creases, but perhaps that was VW’s intention? Some might have regarded the Golf VI as a bit portly, but I think it was and remains an excellent piece of design, especially so as it is a heavy rework of its predecessor, which was definitely too portly, rather than an all new design. For the Golf VII the designers said they focused on the stance and wanted to give the outside of the car the Premium feel they thought the Golf deserves which meant elongated hood and passenger compartment as far removed as possible. I think it kind of works, the VII has its own distinct allure and I don’t know if it’s the power of suggestion but the proportions do give it a more upmarket feel I think. ….And come to think about it, the latest 2019 Focus does seem to have that same ‘held back’ stance the Golf VII has and Ford said they wanted to make the new generation more upmarket. Just to clarify, you mean above the bottom of the DLO, on the C-pillar proper? I’ll get my thinking hat on. And yes the fuel cap cover is on the C pillar, in the lower region, same level as the DLO really. Trapezoidal fuel filler on the C pillar: Seraph/Arnage. This is very good. And not the car I was thinking of. Thanks for ruining my game just to show your knowledge off. Btw, I will give the answer out at 12pm, Bourg Saint Maurice’s time, whichever timezone that is. You go figure it out all yourselves. Hello NRJ, well the Towns Lagonda had to inspire something. I should quit before I get banned. Peugeot 309 3 doors. That was the answer. I will take this opportunity to announce that I will be retiring from the Game circuit for a little while. It has become a ruthless business as recent events have shown. Thankfully I’ll still be able to use my stage name as a male stripper if I must become one to make ends meet. Thank you for your custom. Best wishes to all. There’s a scented tree at the back of the drawer if anyone wants it. Nooooo! How can we go on without you? The knowledge that our loss is every hen party’s gain is scant consolation. What do we have to do to change your mind?